First Kiss Friday with Lane McFarland & a Giveaway! 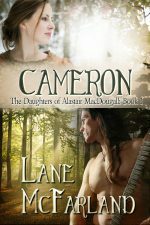 Today on First Kiss Friday I’d like to welcome Lane McFarland as my guest who will be sharing a first kiss scene from her novel Cameron. Lane is also offering a giveaway of any of her eBooks to one random comment so get busy leaving her a message here on my blog. Happy reading and good luck! He leapt onto his horse. The large black animal pawed at the ground while Robert continued to stare at her. The appearance of his dimples and the sparkle in his eyes caused her stomach to flutter. He turned his horse in the direction of Graham Castle and galloped through the woods. Her hands trembled. She pressed her fingers to her lips and stepped away from the tree, searching the path he took, but no one was in sight. Starting out as an accountant in line with the rest of the corporate echelons struggling up the proverbial ladder, Lane soon realized the long nights and numerous weekends of closing books and reporting financial results no longer appealed. So, she decided to hit the road selling financial software. Jumping from one high-pressured frying pan into the other, the stress of the road-warrior life, and constant deadlines took its toll. She needed a release and found that with her face buried in historical romance books, she could escape to worlds of intrigue with timeless love and happily-ever-after endings. Today, she is fortunate to have found her true passion in writing of spirited heroines and to-die-for-heroes and the romantic love stories between them. Lane is a southern girl living on top of a mountain in North Georgia and is most happy when surrounded by family and friends. When she’s not writing, you can find her hiking with her husband, or fiddling around in her flower and vegetable gardens, feeding the birds and watching black bears and deer. Lane is blessed to have a wonderful son—her pride and joy, her buddy who, along with her husband, has made her life complete. Thank you for hosting me today on your beautiful website, Sherry! I love the way Lane leaves a small part of herself in every book she writes . That’s just the vibe I get from the way she writes. Thanks for stopping by Lane and thank you for hosting Lane Sherry. Awww…thank you so much, Alison! Hugs!!! I loved the excerpt. I felt like I was right there with them. Thank you, Michele! I appreciate you stopping by! Lane’s giveaway is now closed. Congratulations to Cheryl, Alison, and Michele. Lane will be email you as she decided to give you each one of her eBooks. Thanks to everyone who stopped by!